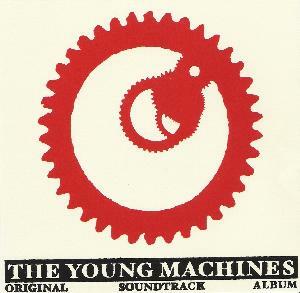 Various Artists - "The Young Machines Original Soundtrack Album"
Soundtracks are often just not that exciting, usually little more than a mixed bag of songs, all by different artists, that are fine as the background for a movie but are not especially memorable overall listening experiences in and of themselves. This, however, is NOT one of those kinda soundtracks, as it actually has a common thread (well, ok, a person) involved in all of the music, namely Rich Barlow. He also happens to be a member of Flaneur Productions, the experimental theatre collective based in Minneapolis who put on the play for which the soundtrack was composed. So, given all of this, what do we have? The group The Pins, who have been around for a while but whom I have not really heard much of, composed the bulk of the music, and most of their "Krautrock spy themes" are moody and atmospheric instrumental slabs that would indeed appeal mightily to fans of 60’s tv out/spy music and contempo outfits such as Cul de Sac. The title track, which makes several appearances in altered versions throughout the CD, is especially catchy, with the kind of riff that will stick in your head but good. Molloy a duo in which Barlow collaborates with John O’ Donoghue (who just happens to be the writer of the play), with a mix of layered drones and percussion on some tracks and the levitational "One Way Ticket", which features chanted, mantra-like vocals over simple hypnotic percussion. The whole thing is rounded out by a couple of tracks by the improvisational group Barlow/Peterson/Wivinius (Wivinius also plays in the fine Minneapolis groups Salamander and Skye Klad) round it out, gentle yet dense pieces of rolling feedback and drones. This is a very fine release and could easily make anyone who is a bit soundtrack-phobic come around. For more information you can visit the Flaneur Productions web site at: http://www.flaneurproductions.com.